Strolling the streets of the City of Love on a wet, wintery afternoon is one of the fondest memories of my year as a Parisian. I'm no fan of cold weather, and would at times find myself complaining bitterly. But when the trees blossomed and the streets began humming with tourists, I felt the pangs of a broken heart. I knew I had fallen in love with Paris in winter. While photographing the bridges over the Seine for my new book, Bridges of Paris, I spent many chilly nights watching the city turn into a winter wonderland. The city changed from a cosmopolitan tourist destination to a collection of small neighborhoods celebrating the holiday season. Walking in Paris is always the right choice. With the tourists back home, the city takes on a relaxed, unhurried rhythm. Music from street accordions and jazz bands create the soundtrack. The drizzly rain comes and goes, the wind may blow, but a strolling tempo always offers the best chance for discovery. Here are my ten reasons for visiting Paris in the winter. "Bonjour, monsieur!" the maître d' calls out as I pass his restaurant. Shopkeepers and waiters are eager to engage casually with travelers and locals in ways impossible in the busy summer and fall seasons. 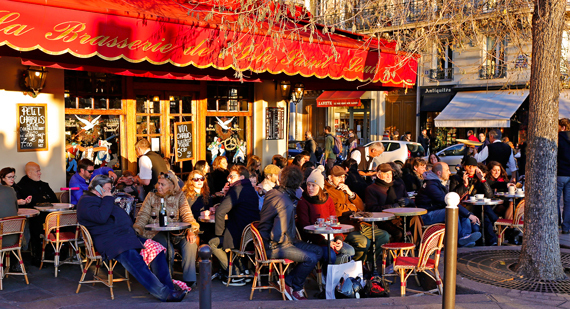 All rumors to the contrary, Parisians are friendly, social, and humorous. When you find yourself one of a few patrons in a shop or restaurant, you are treated more like a guest than a customer. No winter visit is complete without immersion in a holiday market. Paris features six venues, including one on the Champs-Élysées. Traditional festival food is delicious. Items for sale come from around the world and local craftspeople. It's always more festive and satisfying to buy a gift directly from its maker. The French call window shopping lèche-vitrine, literally translated "window-licking." 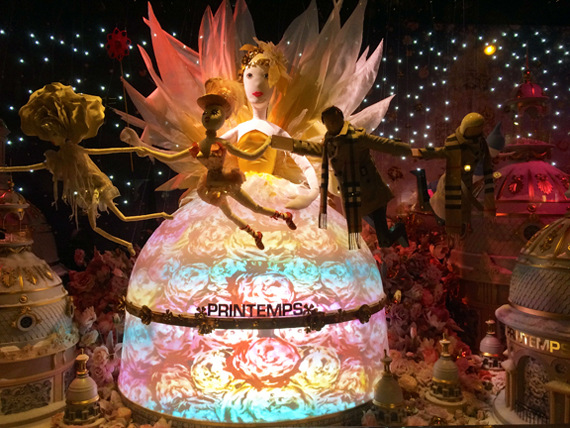 Galeries Lafayette, Printemps, and Bon Marché are the department stores with the most gorgeous, spectacular seasonal displays. Neighborhood boutiques and restaurants offer an intimate alternative to department-store glitz. If the drizzle becomes a downpour, you can move into one of the long shopping arcades covered with glass roofs, known as passages. At the end of the 19th century, more than two hundred crisscrossed the city. My favorite is the Passage des Panoramas near the Grands Boulevards metro. Paris originally became known as the City of Light during the 18th century, in the Age of Enlightenment. However, in winter, illumination comes from blazing street and bridge lamps and strings of multi-colored holiday bulbs. The trees along the Champs-Élysées are dressed with over 150,000 lights. You can pass through the festively lit Place Vendôme and stop by the uncrowded Ritz for a pot of hot tea. Avenue Montaigne, next to the Arc de Triomphe, and quaint Bercy Village, at the east end of Bercy Park, are also colorful places to immerse yourself in holiday spirit. The stunning stained-glass windows of this 13th-century Gothic chapel, which once housed the Crown of Thorns, are a must on any visit to Paris. It was built by King Louis IX, the only French king to become a saint and have a baseball team named after him. Spend an evening enjoying the music of Vivaldi, Pachelbel, and Bach: the Saint-Chappelle's historic architecture and rich acoustics make for celestial holiday concerts. 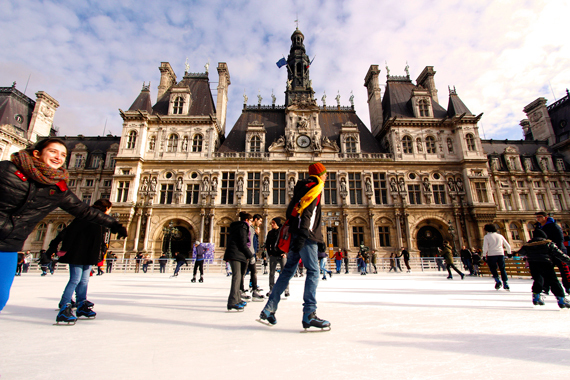 Rent a pair of skates for only five euros at the largest open-air rink in Paris, on the plaza in front of the Hôtel de Ville, the grand City Hall dating from 1533. Smaller rinks abound, including one at the Christmas Market on the Champs-Élysées. Looking for a unique winter memory? Try ice skating 200 feet in the air on the first (not "ground") floor of the Eiffel Tower. Christmas trees are everywhere, in small squares and plazas, on bridges, in department stores, on apartment balconies, and for sale in front of many neighborhood shops. The largest faces Notre-Dame Cathedral. 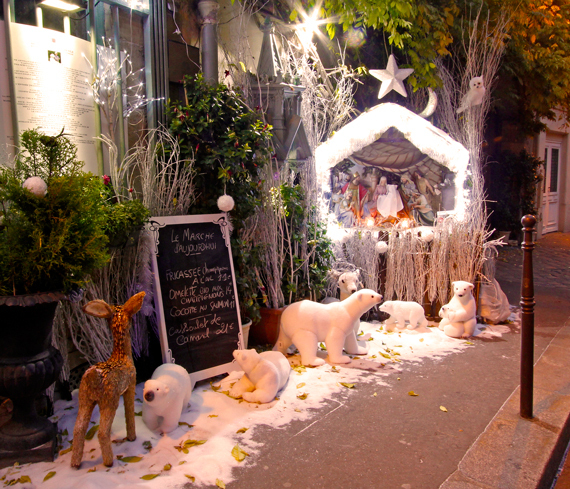 Each church in Paris has a nativity scene ("crèche") on display. I loved discovering the subtle and not-so-subtle differences in each church's presentation. The grandest are at Notre-Dame and the Madeleine church near Place Vendôme. Many restaurants' and boutiques' nativity scenes include polar bears, inspired by Coca-Cola advertisements of the '20s and '30s in which they appeared. Despite the corporate connection, Parisians love their polar bears. 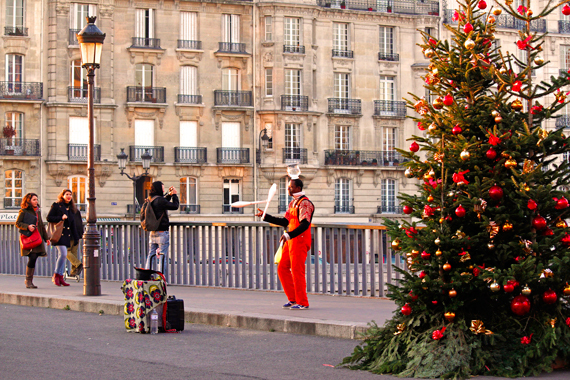 During the winter, Paris becomes a children's fairyland. On street corners, you'll hear shouts of "Chaud les marrons!" from vendors selling chestnuts roasting on coals. Cotton candy or barbe à papa ("papa's beard") is another favorite. Both the Tuileries and Luxembourg Gardens offer pony rides, puppet shows, trampolines, and fountains where young mariners captain miniature sailboats. Christmas carousels ("manèges de Noël") have a history dating back to the jousting contests of the 16th century. Merry-go-rounds, first introduced in the 18th century, pop up everywhere during the holiday season. There are year-round carousels at the Hôtel de Ville and Eiffel Tower, but the vintage manèges in less touristy neighborhoods are more fun. And everyone can enjoy a panoramic view of the City of Light atop the famous Grande Roue ("Great Wheel" or Ferris wheel) on the Place de la Concorde. Outdoor café seating does not disappear in winter. Every sidewalk café serves good food with friendly service, so choose your venue by the ideal table. Enjoy a perfect view of Notre Dame, the Eiffel Tower, or the Champs-Élysées while sipping hot chocolate or a glass of wine. At the right table, the geometric, bare trees and statues in the Tuileries look like a painting from the Romantic Era. Read A Moveable Feast in Hemingway's favorite square, the Place de la Contrescarpe, next to the Rue Mouffetard and its shops. Parisians pride themselves on their fashion sensibility. The locals dress as players in this charismatic city. Black dresses and jackets are accented with flashy leggings, stylish boots, and bold, bright scarves, each like a tiny brushstroke of color in an Impressionist's painting. Scarves of every fabric and design are available throughout the city. No one survives a Paris winter dressed in neutral colors. Growing up in California, I never wore a scarf. But when the November chill rolled in, I became a Parisian, and never left my tiny apartment without a colorful cloth around my neck. 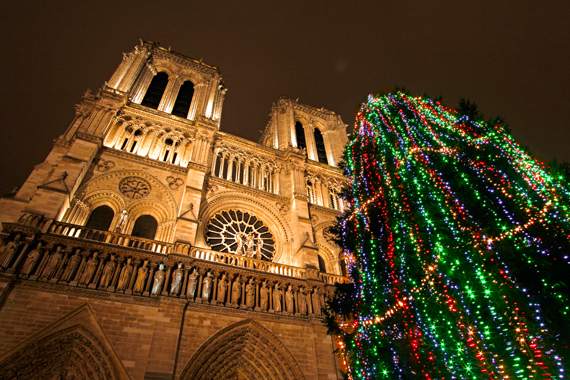 A holiday adventure in wintery Paris is a lifetime memory. Discover the joie de vie ("joy of life") in a friendly, colorful wonderland. You'll love it!